Result: 1 Garscube Harriers ‘B’ 3.36.0; 2 Garscube Harriers ‘A’ 3.45.2; 3 Falkirk Victoria Harriers 3.46.4. At the second Glasgow Gathering, in 1976 Garscube Harriers was again successful, their A team this time, in 3:38.6, from Victoria Park in second and Paisley Harriers were third. It was a wet, windy afternoon at Scotstoun and the heavy track did not make for fast times. There was also a clash of date with a football match at Hampden Park leading to a smaller crowd than usual and several officials calling off. It could have been a reason to terminate the series after only two meetings but the Glasgow Council went ahead with the championship in 1977 when there was another name engraved on the trophy. On 20th May, 1978, there was yet another new name on the trophy. When Victoria Park last won the title, the man on the first leg was British international half-miler David McMeekin. He was again in action that year. “The new Scottish medley relay champions are East Kilbride AAC. After David McMeekin had given Victoria Park a lead of close on 20 yards over the opening 800 metres, East Kilbride pulled back only a little on the both 200m sprints, but on the final 400m Alan Cord tore holes in Ian Smith’s lead and just took the tape by inches, both teams clocking 3 min 34.3 sec. After that near miss, Victoria Park were in action the following year. Between 1946 and 1971, the medley title had been completely dominated by Victoria Park AAC (9 wins) and Bellahouston Harriers (5) with the Edinburgh University squad the next biggest winners (4). 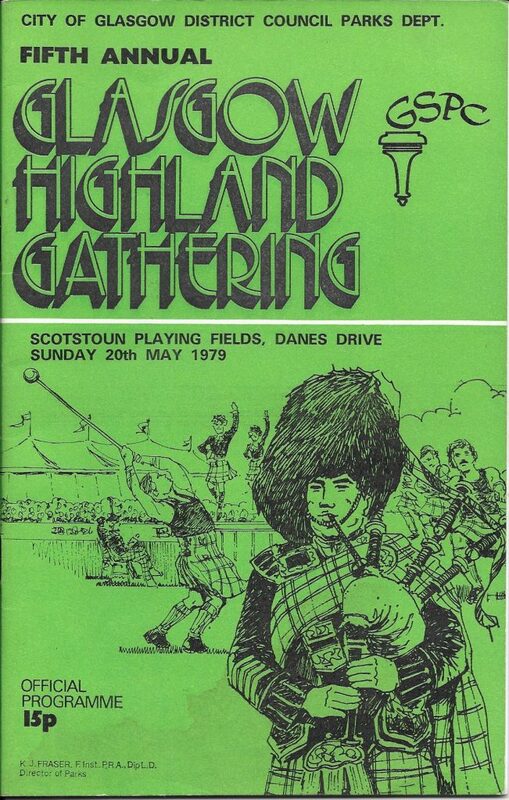 But the 70’s had seen triumphs by Garscube, Central Region and East Kilbride. 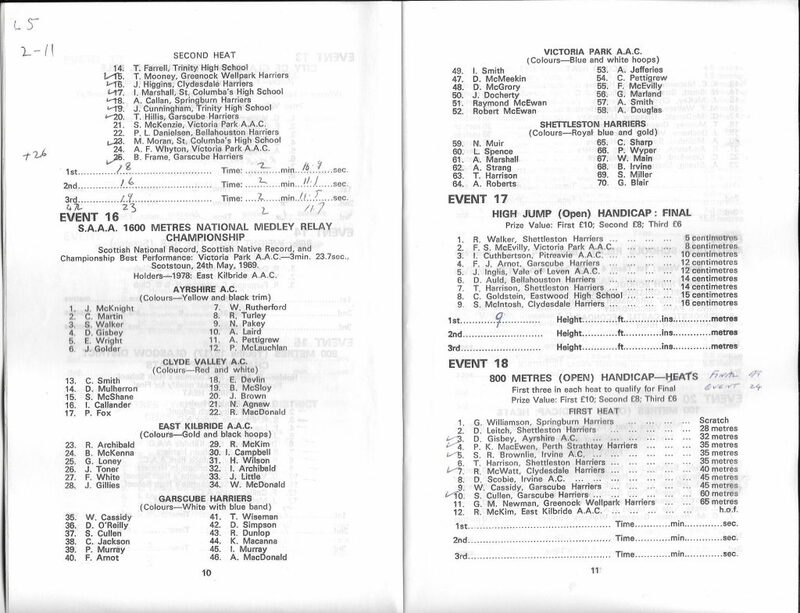 The entries in 1979 included Ayrshire AAC, Clyde Valley AC, East Kilbride AAC, Garscube Harriers, Shettleston Harriers and Victoria Park AAC. This was the day however that the old guard, as represented by the home team, re-asserted itself and Victoria Park won in a time of 3:38.2. The Highland Games continued into 1980 and they retained the medley relay. This suited the runners – a regular venue, on a good track with decent changing rooms and ease of access. Victoria Park fought hard to retain their title but had to give best to a Glasgow University AC team from just up the road at Westerlands who won by 0.7 seconds in 3:31.2.